If you're like me, you do a lot of cooking. And if you're like me, most of your cooking is utilitarian. Don't get me wrong: I like to cook. I'm grateful to have plenty of food to eat. I consider it a privilege to feed my family and other people. But most days my cooking is limited to getting dinner on the table with some baking thrown in on the side. So every now and then I've found it to be really good for me to make something just for fun. Nothing complicated or expensive, but delicious. Something like sausage balls. If you've never made them, you're in for a treat. They're the easiest but most delicious little snack ever. They're an appetizer that always gets devoured at parties, but they're also handy to keep in the freezer for an on-the-go breakfast. Mix together. Shape into small balls. Bake at 325 degrees for 25 minutes. Hint: If you're blessed to have a stand mixer, use the dough hook attachment to mix the ingredients. For easy clean-up, line baking sheet with parchment paper. 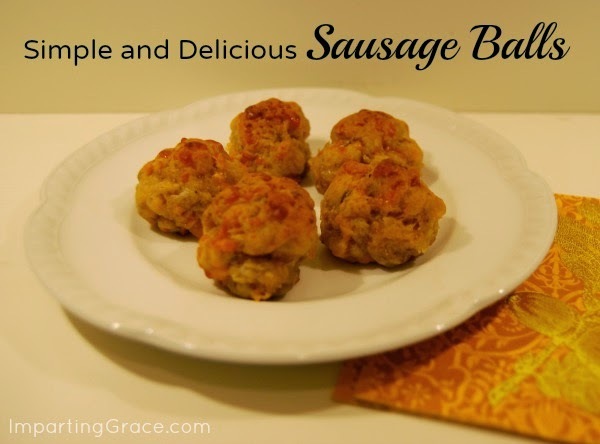 Obviously, sausage balls are not a low-fat treat, so they're best enjoyed in moderation. But I've found that sometimes a small portion of a food that's truly delicious is more satisfying to me than even a large quantity of something less enjoyable. And he loved over nine hundred years. From The Best Loved Poems of the American People (New York: Doubleday and Sons, 1936). Author unknown. How about you? When was the last time you cooked something just for the fun of it? This post is the eighth entry in a 31-day series: Caring for Myself Body and Soul. This is something I always make every Christmas season - love these! I use a spicy sausage for a little kick! I love to cook - just a little lazy since the girls grew up and left the coop!! Will be making these for the game this weekend. Thanks! I LOVE sausage cheese balls! And my kids don't think Thanksgiving and Christmas are complete without them. Like Patti, I like it better with spicy sausage, but out of consideration for those in our family who can't handle it, I make a double batch with one pound of spicy and one of mild...for a medium kick...and more to enjoy. I love sausage balls and usually only have them at Christmas time. Now I have a big craving for them! I love sausage balls! I have to admit...sometimes we just have sausage balls with some hummus and pita chips for dinner. :) I never thought to freeze them. Great idea! So convenient for those crazy mornings trying to get everyone out the door. My mom used to make these when I was little for parties and they are AMAZING.